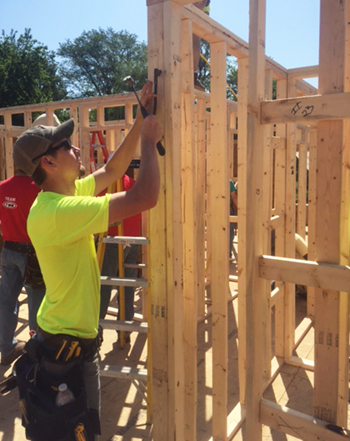 Members of the Southern Illinois University Edwardsville Constructor’s Club are eager to put their construction training to meaningful use, spending multiple weekends volunteering for projects around the area. In addition to continued support with Habitat for Humanity projects, four members of the club participated in the East Side Heart and Home Family Center’s Blitz Build on Saturday, May 13 in East St. Louis. They volunteered to assist with the construction of a four bedroom, approximately 1,200 sq. ft. house. Participating members included construction management majors Aaron Borrowman, a junior from Rockport, Jordan Grant, a senior from Peoria, Cody Kruse, a senior from Highland, and Will Zerr, a senior from St. Peters, Mo. Club members learned of the opportunity to assist through the local chapter of the Associated General Contractors of America, as well as Korte and Luitjohan Contractors. 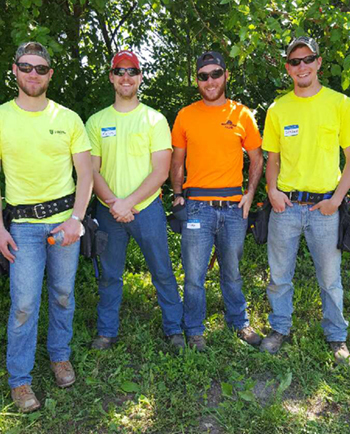 Photo: Participating members from the SIUE Constructor’s Club included construction management majors (L-R) Will Zerr, a senior from St. Peters, Mo., Aaron Borrowman, a junior from Rockport, Cody Kruse, a senior from Highland, and Jordan Grant, a senior from Peoria. Jordan Grant, vice president of the SIUE Constructors Club, puts his skills to use during the East Side Heart and Home Family Center’s Blitz Build.